House Democrats Deliver Gun Control Sit-In Via Periscope, Facebook Live : All Tech Considered Despite cameras on the House floor going dark, a band of Democrats staging a sit-in to insist on a vote on gun control streamed the event, and conducted interviews with media, through smartphones. This photo provided by Rep. John Yarmuth, D-Ky., shows Democrat members of Congress, including Rep. John Lewis, D-Ga., (center) and Rep. Joe Courtney, D-Conn., (left) participating in a sit-down protest seeking a vote on gun control measures, Wednesday on the House floor. The protest that played out Wednesday on Capitol Hill wasn't quite plebiscite by Periscope. But it came close. Dissident lawmakers relied on digital platforms devised in the second decade of the 21st century to circumvent the leaders of the U.S. House of Representatives, an institution more likely to be inspired by mores from the 19th century. In so doing, they forced public consideration of gun control, an issue many politicians would prefer to avoid. 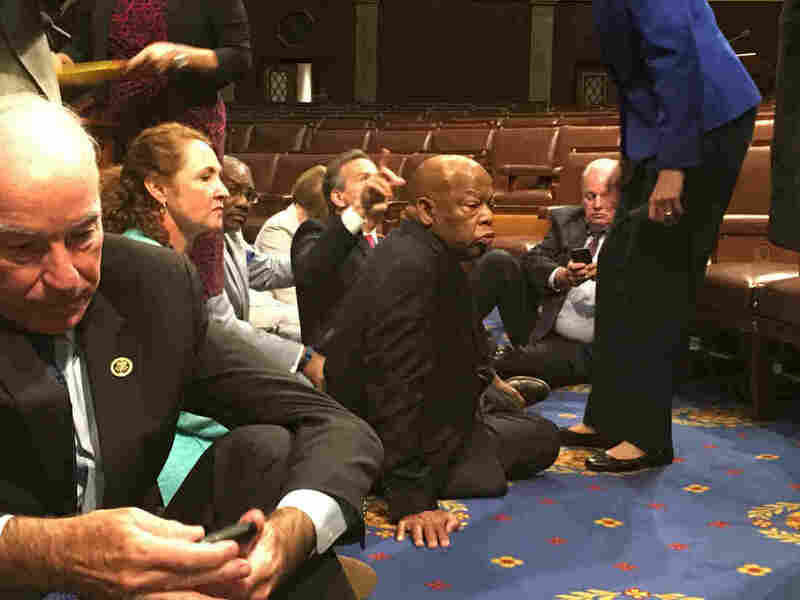 A band of House Democrats staged a sit-in just before noon on Wednesday to insist on a vote on a gun control measure. Led by the legendary civil rights leader and Rep. John Lewis, the lawmakers, some in their 70s, sat gingerly down on the House floor, intentionally evoking the rhetoric and the choreography of protest movements of the 1960s. They stayed for hours, drawing strength and greater numbers over the course of the day. House Speaker Paul Ryan declared the House in recess. And that kicked the rules into effect: The cameras above went black. They could not capture the drama playing out below. advisory note to NPR News staffers containing this unusual admission: "The House is currently out of session so there is no audio or visual of this, and we are not allowed to roll on the House if they are not in session, nor can we take any pictures or video." Out of session, despite the frenzy of activity down on the House floor. So the House Democrats started to roll on themselves — using the everyday tools of smartphones and wireless connections — to document their protest and allow broadcast of their grievances. Suddenly, instant video feeds afforded by Periscope and Facebook Live reflected the intensity of the exchanges on the floor. C-SPAN ended up carrying video from House members. Ultimately, so did the major commercial cable news channels. Viewers saw speeches of varying quality and at least one conversation about the merits of journalistic courses in college, and how well they prepared one for digital video. In capturing and transmitting that video, House members violated the House's rules. But Republicans appeared stymied in trying to figure out how to address such journalistic-ish transgressions by their own colleagues. And Democrats shouted down Ryan as he sought to schedule votes on procedural measures unrelated to guns. Late Wednesday night, CNN's Dana Bash tweeted that Rep. Steve Israel was giving an interview live with the network from the House floor via Apple's FaceTime application. That, too, was a violation of the rules. The House protest also reflected the public's dismay and well-grounded belief that Washington, D.C., is so tied in knots that it cannot act in the face of crisis, a sentiment vital to the campaigns of Republican Donald Trump and Democrat Bernie Sanders this year. On Wednesday, Ryan called the protest "a publicity stunt." Absolutely true. As were, in a larger sense, the sit-ins at racially segregated lunch counters that were part of Lewis' early civil rights activities. Those protests drew the attention of national media to the struggles of blacks for equal rights in the South. This week's demand for a vote was doubly symbolic: It was almost certain to fail in the Republican-dominated House, and the specifics of the measure itself were considered problematic by many liberals otherwise well-disposed to new gun control laws. Without the footage, coverage would have been far more meager. In this case, the streams from the House floor won great publicity online and on cable television for champions of gun control. The media headline offers a different focus. The incident demonstrates that officials cannot count on wiping activities in public places from common memory simply by forbidding their depiction. Especially not in circumstances when a single person, even a member of Congress, can wander in with a smartphone and decide for himself or herself what's newsworthy, with the ability to post live streams that can go viral.